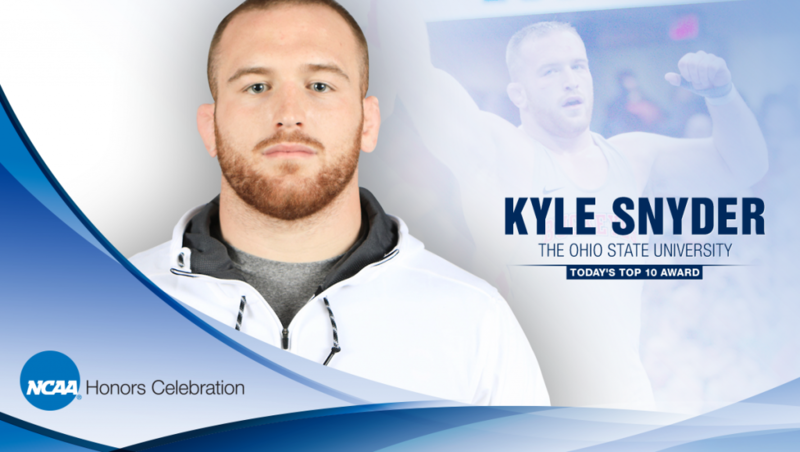 COLUMBUS, Ohio – Ohio State wrestling legend Kyle Snyder has been selected as one of 10 NCAA student-athletes across ALL sports and ALL divisions to be honored as the 2019 Today’s Top-10 Award winners. The award recognizes former student-athletes for their successes on the field, in the classroom and in the community. Recipients completed their athletics eligibility during the 2017-18 academic year and will be recognized at the Honors Celebration on Wednesday, Jan. 23, in Orlando, Florida. The honorees are selected by the NCAA Honors Committee, composed of representatives of NCAA member schools, conferences and distinguished citizens, including past awardees. The NCAA Today Top 10 Award has been recognized since 2013 with the ‘Top VIII’ preceding it from 1973-12. Snyder is just the fifth Buckeye to earn the distinction and eighth wrestler overall. Previous Ohio State recipients include: Craig Krenzel (football ’04), John Frank (football ’84), Archie Griffin (football ’76) and Timothy Moore (diving, ’76). Kyle Snyder, a 2018 graduate of Ohio State, captured both the Big Ten and NCAA heavyweight wrestling titles in 2016, 2017 and 2018. Snyder reached the NCAA finals all four seasons and helped the Buckeyes to an NCAA team championship in 2015 with runner-up finishes in 2017 and 2018. He earned All-America honors during each campaign and was named the Most Outstanding Wrestler at the 2016 NCAA Division I Wrestling Championships. That same year, he brought home Olympic gold in Rio de Janeiro, leading to his distinction as the 2017 U.S. Olympic Committee’s Male Athlete of the Year. Snyder added multiple world titles while at Ohio State, becoming the youngest Olympic and world champion in U.S. wrestling history. Snyder’s academic success earned him the Big Ten Medal of Honor in 2018, an award given to a student-athlete from the graduating class of each university who attained the greatest proficiency in athletics and scholastic work. Additionally, he earned all-academic honors from the National Wrestling Coaches Association for four straight years, as well as Academic All-America honors from the College Sports Information Directors of America in 2017. Outside of sports, Snyder is committed to making a positive impact on the lives of children in his community. He has spent numerous hours with youth-focused organizations such as the Casey Cares Foundation, the 2nd & 7 Foundation and Nationwide Children’s Hospital. Snyder also served as a motivational speaker at local elementary, middle and high schools and as a youth club wrestling instructor in the Columbus, Ohio, area.